SAN JOSE, CA—(Marketwired – Dec 29, 2014) – TiVo Inc. (NASDAQ: TIVO), a leader in the advanced television entertainment market, today announced that President and CEO Tom Rogers will present at the 2015 Citi Internet, Media & Telecommunications Conference on Tuesday, January 6th, 2015. A webcast of the presentation will be available on the Investor Relations section of the TiVo website at http://investor.tivo.com under the events calendar tab. TiVo Inc. (NASDAQ: TIVO) is a global leader in next–generation television services. TiVo's innovative cloud–based Software–as–a–Service solutions enable viewers to consume content across all screens in and out–of–the home, providing an all–in–one approach for navigating the 'content chaos' by seamlessly combining live, recorded, on–demand and over–the–top television into one intuitive user interface. The TiVo experience provides TV viewers with simple universal search, discovery, viewing and recording from any device, creating the ultimate viewing experience. TiVo products and services are available at retail or through a growing number of pay–TV operators world–wide. TiVo's multiple subsidiary companies provide the broader television industry and consumer electronics manufacturers, cloud–based video discovery and recommendation options, interactive advertising solutions and audience research and measurement services. More information at: www.TiVo.com. SHARM EL SHEIKH, EGYPT—(Marketwired – Dec 29, 2014) – When it comes to luxury resorts in Sharm El Sheikh, the Sharm El Sheikh Marriott Resort has long stood out with exceptional restaurants and an enviable beachfront location. But the hotel is adding another feather to its cap as it blends luxury with sustainability and joins the Green Star Hotel Programme. The partnership between this Red Sea beach resort and the Green Star Hotel Programme has enjoyed a natural evolution. As Egypt's premier eco–certification agency, the Green Star Hotel Programme works with hotels and resorts to reduce their carbon footprints and enhance sustainability. Its certifications and capacity–building programs are recognized both nationally and internationally. But environmental responsibility isn't new to this luxury hotel in Sharm El Sheikh. For example, the property hosted its second Underwater Coral–Cleaning Day on December 2, 2014, an event that attracted the attention and praise of none other than J.W. 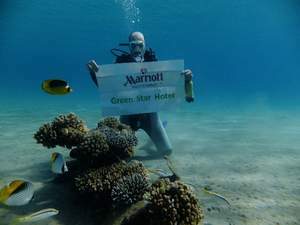 Marriott, Jr. During the project, hotel associates donned scuba gear donated by a local scuba school and dove into the crystalline waters to collect trash that had accumulated on the sea floor. As the property embarks on this new, more regulated plan for sustainability, it will revisit every aspect of its operation. Light bulbs, for instance, will be replaced with more efficient LED versions. Water consumption will receive a thorough examination as the hotel works to improve waste management and use recycled water to irrigate at least 75% of its gardens, landscaping and recreational facilities. And monthly reports detailing the hotel's usage of electricity, fuel, fresh water, irrigation water and chemicals (including detergents, pesticides and fertilizers), as well as its carbon emissions, will be submitted to the Green Star Hotel Programme for evaluation. The hotel even has a plant house that produces organic vegetables and herbs, like tomatoes and cucumbers. As its efforts prove, being green isn't easy. But guests of this 5–star hotel in Sharm El Sheikh will reap the benefits of its membership with the Green Star Hotel Programme. In addition to providing guests with the peace of mind that comes from helping the planet, the hotel is doing its part to ensure that visitors and locals alike will be able to enjoy the natural beauty of the region in the years to come. At the Sharm El Sheikh Marriott Resort, guests encounter a stunning, 520–room resort directly on the Red Sea. Its beachfront location affords every opportunity for recreation, whether guests choose to snorkel, swim, scuba dive, sail, surf or simply sunbathe. Plus the four swimming pools and fitness center ensure every visit feels like an exquisite vacation. Nine dining venues range from the award–winning Kona Kai sushi restaurant, to Parmizzano's Italian Restaurant and Harry's Pub for memorable meals. Groups enjoy several options for functions, whether they're gathering in the more than 3,000 square feet of meeting space for a conference, or celebrating a special occasion on the beach. Whatever brings guests to the property, everyone can look forward to relaxing in one of the well–appointed guest rooms featuring plush bedding, beautiful views and high–speed Internet access. And with national attractions like Ras Mohammed National Park and Bedouin safaris accessible by day, and the city's exciting nightlife just steps away, guests will find countless ways to experience Egypt. LAS VEGAS, NV—(Marketwired – Dec 29, 2014) – Tucked away inside the Renaissance Las Vegas Hotel, ENVY Steakhouse sets the stage for vibrant culinary expression, and its star chef is the main attraction. Throughout his time at the award–winning steakhouse, Executive Chef Christophe Mihy's global culinary experience has led ENVY to unleash wholly new dining concepts and flavors, resulting in an ever–changing menu that's uniquely modern and boldly fresh. 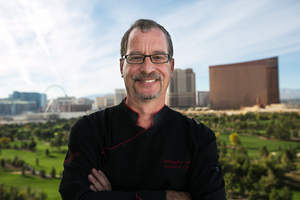 Following a 35–year culinary career that spanned four countries and countless five–star hotels, Chef Mihy joined the Renaissance Las Vegas Hotel in 2007. The creative visionary behind ENVY and its focus on fresh, seasonal fare, Chef Mihy ignites his team with his warmth and unwavering work ethic, which shows in every corner of the beloved Las Vegas steakhouse. In his role as Executive Chef of the luxury hotel, Chef Mihy oversees all food & beverage operations and continues his distinguished and adventurous career at one of the only non–smoking, non–gaming hotels near the strip. His culinary journey began in the most prestigious environments, training with world renowned chefs spanning France and the United States in Michelin star rated restaurants. His most notable instruction came from “Chef of the Century” Joel Robuchon at the legendary Jamin in Paris. His career eventually led him to take the helm at several four and five star restaurants as far away as the French West Indies and off the coast of Africa in Mauritius Island. At ENVY, his focus is on the finest cuts and the freshest, local ingredients, using them to craft a menu that's seasonal and innovative from the very first bite. ENVY sources from some of the best purveyors in the country, and offers a wine wall and cellar featuring more than 1,500 bottles of wine. Its award–winning menu has cemented its status as one of the best steakhouses in the country, a vision that Chef Mihy and his team bring to life every day. A dramatic departure from the traditional, the Renaissance Las Vegas Hotel offers a quietly cool, boutique environment with luxurious amenities to enhance relaxation at every turn. Just blocks from the famed Las Vegas Strip and adjacent to the Convention Center, this four diamond, hotel in the heart of the city is the largest smoke–free, non–gaming facility in the area. With its sleek style, spacious accommodations and caring service, travelers can enjoy its unique blend of Las Vegas luxury, quiet comfort and culinary discoveries. From Angus filet and bone–in rib eye, to dishes made with locally sourced ingredients, ENVY is one of the best steakhouses in Las Vegas, while the new Grill 55 offers affordable comfort food and seasonal cocktail menus. Here, travelers can escape to the Entertainment Capital of the World and rediscover how subtly sophisticated a hotel near the strip can be, while enjoying easy access to everything in the city. Crescent Hotels & Resorts is a nationally recognized, top–10 independent third–party operator of hotels and resorts. Crescent currently operates over 80 hotels and resorts, with close to 19,000 rooms in 29 states and Canada. Crescent is one of a small group of independent management companies approved to operate hotels under the Marriott, Hilton, Starwood, Hyatt and InterContinental flags. Crescent also operates a collection of legendary independent hotels and resorts. For more information, please visit www.chrco.com. ST. LOUIS, MO—(Marketwired – Dec 29, 2014) – Reinsurance Group of America, Incorporated today announced the completion of an agreement under which its primary U.S. operating company, RGA Reinsurance Company (“RGA”), will retrocede a block of U.S. individual life business to the retrocession operations of Pacific Life Insurance Company. The block of business to be retroceded is comprised of term and permanent individual life policies written by U.S. insurers and assumed by RGA primarily between 1999 and 2004. RGA will retrocede approximately $200 billion of in–force individual life reinsured amount at risk. The effective date of the transaction is October 1, 2014. “We are pleased to have been able to work with Pacific Life, a long–standing trusted partner, to find an opportunity that provides them with additional mortality risk and also allows us to release capital that can be deployed into other opportunities. This transaction highlights the attractiveness of mortality blocks to entities with complementary risk profiles,” said Anna Manning, Senior Executive Vice President, Global Structured Solutions, RGA. San Diego Private Bank provides extraordinary levels of service to individuals and small businesses and specializes in financing investor commercial properties, owner occupied buildings and construction loans. The Bank also offers various portfolio and government guaranteed programs, including cross–border Export–Import Bank programs. San Diego Private Bank, is a SBA Preferred Lender. San Diego Private Bank is publicly traded on the Over–the Counter Bulletin Board (OTCQB) under the ticker symbol “SDPB”. This press release may include forward looking statements that involve inherent risks and uncertainties. San Diego Private Bank cautions readers that a number of important factors could cause actual results to differ materially from those in the forward‐looking statements. These factors include economic conditions and competition in the geographic and business areas in which San Diego Private Bank operates, our ability to successfully integrate the operations of merged banks, inflation, fluctuations in interest rates, legislation and governmental regulation. You should not place undue reliance on forward‐looking statements and we undertake no obligation to update those statements whether as a result of changes in underlying factors, new information, future events or otherwise. CHICAGO, IL—(Marketwired – Dec 29, 2014) – Practice HORA USA (horausa.com) announces the release of the Book: “Zen Tales by Master HORA” in English language. This book is about finding a way out of deadlock. It is made with a positive attitude. This book “Zen Tales by Master HORA” has 112 Zen Master answers to the questions from doctors, musicians, business people, scientists, parents, and students from different parts of the world. “We translated this book because no matter who or what influences the person, economy, politics, ideology, opinions of relatives — these attempts are always felt and become emotional irritation. This irritation can move a person to a conflict, however, due to irritation, the mind has been darkened; it is easy to lose logical argument. “The answers in this book, will strengthen readers' intelligence — because the reader has gone through Zen training for their mind. Their psycho–intellectual muscle has gone through Zen fitness. 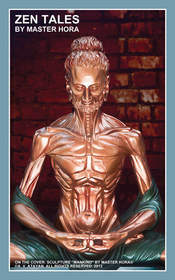 This book can help reader to prevent loss of time, help to recover from less optimized destiny. Now, English speaking population has the ability to train modern Zen fitness for their mind,” said Svetlana Baklanova, Practice HORA leader in the U.S.A. and translator of this book. It is the best NOT to read this book in the usual order, page by page. Rather, this book should be read while in the process of contemplation over an emotional question. The objective of this book is to awaken in a person the desire for positive change. Correct Development Of Children. How Can This Be Achieved? Practice HORA® is based on the evolutionary–meditative teaching and physical practice created by Master HORA in the late 1980s. It is a training method of growing individual life potential, natural health and reversing biological age. Practice HORA presents a unique natural psycho–physical training system where mind and body develop naturally as one. More than 25 training centers worldwide. MIAMI, FL—(Marketwired – Dec 29, 2014) – Creating spaces to meet the needs of next generation business travelers, Miami Marriott Biscayne Bay's recently completed multi–million dollar meeting space renovation is setting the pace for successful events with innovative spaces, state–of–the–art technology and eco–friendly designs. Maintaining a bold waterfront presence near Miami's Artsand Design Districts, the new look and intuitive service of the downtown Miami hotel's impressive spaces represent the future of travel and set the stage for inspirational gatherings. According to General Manager David Cesario, Miami Marriott Biscayne Bay's 20,000 square feet of flexible event space, which includes 23 meeting rooms, a 9,860 square foot Grand Ballroom and the 2,500 square foot Bayview Ballroom with incredible bay views, were all involved in the three–month renovation project. Beyond new floor and wall coverings, lighting and furniture, the newly renovated Miami meeting space also features a state–of–the–art audio/visual system and high–speed wireless Internet. Reflecting the hotel's eco–friendly status as a Palm–1 certified property, old escalators were replaced with new units featuring “Smart Sensor” technology that slows them down to conserve energy when not in use. LED lighting was installed throughout the renovated spaces and elevators were refurbished. In following that theme, the hotel offers event planners room set–up options that include couches, pods, and even beanbag chairs to create a more casual and relaxed vibe for their Miami business meetings. Renovation at the Miami Marriott Biscayne Bay ties in with Marriott Hotels' goal to re–imagine traditional meeting spaces to meet a growing demand for more inspiring and creative work environments. Marriott Hotels is re–thinking everything from boardrooms and breakouts to pre–function spaces, taking a holistic approach to meetings and seamlessly integrating service, technology, and contemporary design. 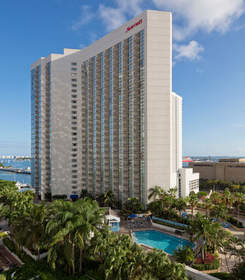 For more information on hosting events at this newly renovated Miami destination, call 1–305–579–0108 or visit http://www.marriott.com/hotels/event–planning/travel/miabb–miami–marriott–biscayne–bay/. A bold and sophisticated destination, the Miami Marriott Biscayne Bay sits at the intersection of the Miami Arts, Wynwood and Design Districts, just minutes from the Miami Beach Convention Center, offering business and leisure travelers the perfect opportunity for blending work and play. Unique in Miami, the property is the only marina–front downtown hotel. It features a sparkling lobby with contemporary work pods, wireless Internet, and on–site dining options that include an Illy Cafe, as well as jaw–dropping views and outdoor seating at the popular Catch Grill & Bar. Boasting 600 exquisitely–appointed guest rooms and suites, an outdoor pool and fitness center, the hotel is Palm–1 certified, recognized by the Florida Department of Environmental Protection for its efforts to conserve and protect the state's natural resources. Bitcoin Shop, Inc. plans to build a universal digital currency platform with the goal of enabling users to engage in the digital currency ecosystem through one point of access. We currently operate our legacy ecommerce website (www.bitcoinshop.us) and are operating our public beta site (www.btcs.com) where consumers can purchase products using digital currency such as bitcoin, litecoin and dogecoin, by searching through a selection of over 250,000 items. We provide our customers competitive pricing options from 256 retailers through our “Intelligent Shopping Engine”. All ecommerce customer orders are fulfilled by third party vendors. We plan to use our ecommerce platform as a customer on–ramp for a broader digital currency platform. We have been actively partnering with strategic digital currency companies who have technologies, services or products that are complementary to our business strategy by making investments in them and integrating with them. Digital currencies use peer–to–peer networks to facilitate instant payments. They are categorized as cryptocurrencies, as they use cryptography as a security measure. Digital currency issuances and transactions are carried out collectively by the network, with no central authority, and allow users to make verified transfers. Certain statements in this press release constitute “forward–looking statements” within the meaning of the federal securities laws. Words such as “may,” “might,” “will,” “should,” “believe,” “expect,” “anticipate,” “estimate,” “continue,” “predict,” “forecast,” “project,” “plan,” “intend” or similar expressions, or statements regarding intent, belief, or current expectations, are forward–looking statements. While the Company believes these forward–looking statements are reasonable, undue reliance should not be placed on any such forward–looking statements, which are based on information available to us on the date of this release. These forward looking statements are based upon current estimates and assumptions and are subject to various risks and uncertainties, including without limitation those set forth in the Company's filings with the Securities and Exchange Commission, not limited to Risk Factors relating to its digital currency business contained therein. Thus, actual results could be materially different. The Company expressly disclaims any obligation to update or alter statements whether as a result of new information, future events or otherwise, except as required by law. NAPLES, FL—(Marketwired – Dec 29, 2014) – On January 4, 2015, The Ritz–Carlton, Naples will unveil a stylish new take on brunch with a tapas–inspired menu featuring small tastes of popular brunch dishes. The innovative menu will be available at Bites, located in the Florida resort's stunning and sophisticated Lobby Lounge, and will include enticing favorites such as eggs benedict, latkes, ricotta and strawberry blintzes, sweet potato yuka hash browns, and French toast sticks. The small plate menu is designed so guests can order a few menu items at a time and share the “bites” with the whole table to add variety and enhance the experience. Additionally, Bites Brunch will feature live contemporary music as well as a selection of brunch cocktails including Bloody Marys, Bellinis and fresh pressed juices. Brunch selections range from $5 – $15. 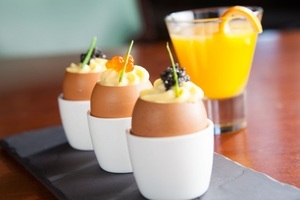 Bites Brunch at The Ritz–Carlton, Naples will be available beginning January 4, 2015 on Saturdays and Sundays from 11 a.m. – 2 p.m. Bites Brunch is recommend for guests ages 14 years and older. The Ritz–Carlton Hotel Company, L.L.C., of Chevy Chase, Md., currently operates 87 hotels in the Americas, Europe, Asia, the Middle East, Africa, and the Caribbean. More than 30 hotel and residential projects are under development around the globe. For more information, or reservations visit the company web site at www.ritzcarlton.com, and for the latest company updates, visit news.ritzcarlton.com. The Ritz–Carlton Hotel Company, L.L.C. is a wholly–owned subsidiary of Marriott International, Inc. (NASDAQ: MAR). Located on the pristine white sands of Southwest Florida's Gulf Coast, the Forbes Five Star, AAA Five Diamond Ritz–Carlton, Naples appeals to today's sophisticated traveler with an array of pampering amenities. With 450 guest rooms and suites — all with stunning views of the Gulf of Mexico — the resort offers a variety of innovative dining experiences, a luxurious, 51,000–square–foot Ritz–Carlton Spa®, two heated pools, a high–tech entertainment lounge, an interactive environmental children's program and a wide selection of beach activities and water sports. Consistently, readers of Travel + Leisure and Condé Nast Traveler magazines rank The Ritz–Carlton, Naples beach resort among the best in Florida, the U.S., and the world. Dec. 4, 2010, marked The Ritz–Carlton, Naples' 25th anniversary. The AAA Five Diamond, Forbes Four Star Ritz–Carlton Golf Resort, Naples is renowned for its exceptional personalized service, inventive cuisine and luxurious accommodations, with panoramic views of the adjacent Greg Norman–designed Tiburón Golf Club. The 295–room Mediterranean–style resort, ranked as one of the top hotels in the U.S. by U.S. New & World Report (2014), is home to a pair of 18–hole signature Greg Norman golf courses at Tiburón and is the location to the annual PGA TOUR's Franklin Templeton Shootout, hosted in December and the LPGA's CME Group Tour Championship event, held in November. The Tiburón Golf Course complex is complete with the with the PGA TOURAcademy, recognized as one of the top academies in the country and the TaylorMade Performance Lab which unites the golfer and fitter with advanced technology to create the ultimate club fitting experience. January 4, 2012, marked the 10th anniversary of The Ritz–Carlton Golf Resort, Naples. SAN JOSE, CA and MISSISSAUGA, ON—(Marketwired – Dec 29, 2014) – Sphere 3D Corporation (NASDAQ: ANY), a virtualization technology and data management solutions provider, today announced RDX+™ (RDX Plus), the industry's first groundbreaking software technology designed for 64–bit software architectures that enables support for disk drive capacities greater than 2TB while maintaining backwards compatibility with its QuikStor® backup appliances. Compared to other RDX solutions with 2TB maximum capacities, RDX+ enabled backup appliances will be uniquely differentiated with backward and forward compatibility with Sphere 3D's QuikStor appliances as disk drive capacities grow beyond 2TB. All existing QuikStor product investments made by Sphere 3D customers are protected and will support the larger than 2TB cartridges with a non–disruptive upgrade to RDX+ technology. Similarly, Sphere 3D's OEM partners who currently ship QuikStor backup appliances, including HP, IBM, Fujitsu, Hitachi, NEC, Lenovo and Toshiba, will receive the updated RDX+ software technology to support the future needs of their customers for RDX®–enabled drive capabilities larger than 2TB. International Data Corporation (IDC) expects purpose–built backup appliance (PBBA) revenue to be $3.38 billion in 2014 and grow to a 7.4% CAGR through 2018 when it will reach $4.49 billion. The Sphere 3D RDX–enabled QuikStor backup appliance is a purpose–built solution with removable storage capability and encrypted security that seamlessly integrates into existing environments, and offers a simple plug–and–play operational experience. With over 450PB capacity deployed in the market during the last three years, Sphere 3D's QuikStor is a proven enterprise–class solution. Sphere 3D Corporation (NASDAQ: ANY) is a virtualization technology and data management solutions provider with a portfolio of products that address the complete data continuum from active data to data at rest. Dedicated to continue to lead through innovation, Sphere 3D enables the integration of virtual applications, virtual desktops, and storage into workflow, and allows organizations to deploy a combination of public, private or hybrid cloud strategies. Sphere 3D's Glassware 2.0® platform delivers virtualization of some of the most demanding applications in the marketplace today, making it easy to move applications from a physical PC or workstation to a virtual environment. Sphere 3D's V3 converged infrastructure solutions include one of the industry's first purpose–built appliances for virtualization and the Desktop Cloud Orchestrator™ management software for VDI. Overland Storage and Tandberg Data, wholly–owned subsidiaries of Sphere 3D, provide an integrated range of technologies and services for primary, nearline, offline, and archival data storage through their data storage, data management and data backup brands, SnapServer®, SnapScale®, SnapSan®, NEO® and RDX®, that make it easy and cost–effective to manage different tiers of information over the data lifecycle. For additional information, visit www.sphere3d.com, www.overlandstorage.com, and www.tandbergdata.com.